... is a biannual refereed journal covering all aspects of tropical ecology. Papers reflect results of original research (major papers, short communications) or review important fields in tropical ecology. We offer free full-text pdf-download of papers from backissues older than three years. 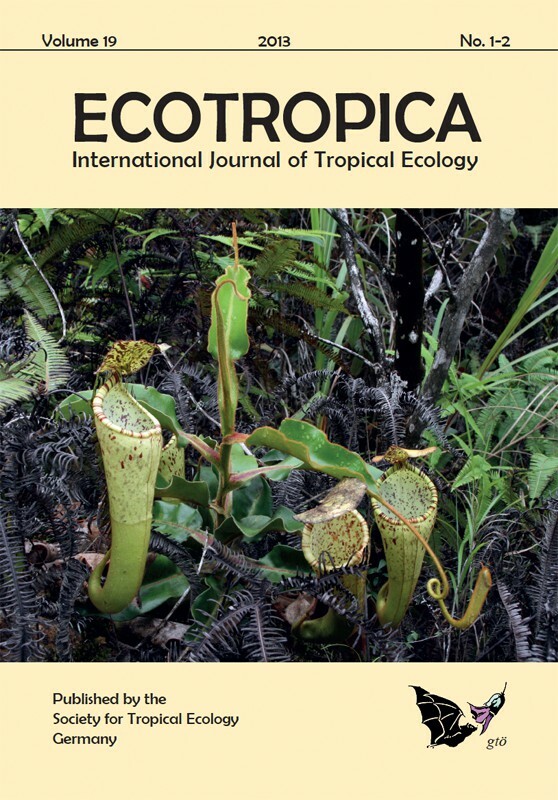 ECOTROPICA is a refereed journal covering all aspects of tropical ecology. Papers submitted shall reflect the results of original research (major papers, short communications) or review important fields in tropical ecology. Color plates may be included. Page charges are not required for contributors to ECOTROPICA, but compensations for printing expenses will be appreciated. All persons interested in publishing in ECOTROPICA are kindly asked to send their manuscripts to ECOTROPICA, Elisabeth Kalko and Marco Tschapka, Dept. Experimental Ecology (Bio3) University of Ulm, Albert-Einstein-Allee 11, D-89069 Ulm, Germany, email: ecotropica [at] uni-ulm.de.